Wine lover or not, a visit to the Cape Winelands is an absolute must as the region is one of breathtaking vistas and majestic mountain backdrops while being steeped in rich culture and history. Rolling vineyards and quaint Cape Dutch homesteads await you, as well as award-wining wine farms offering some of the country's best wines. 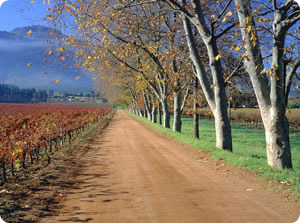 The winelands are divided into various different regions, each offering their own 'wine route'. 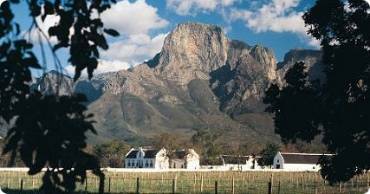 The most popular and well-known are Stellenbosch, Franschhoek, Wellington and Paarl. The wine farms of Stellenbosch are the closest in distance to Cape Town and are within a 45-minute drive of the city centre. This is the most well known wine region and is home to a variety of cellars- producing some of the country's most acclaimed wines. The town of Stellenbosch is a univeristy town and the oak-lined Dorp Street is home to museums and galleries as well as many student cafes and restaurants. Wine tasting, cellar tours and stopping to enjoy the scenic beauty at the various wine farms could easily take a day or more, so it is advisable to have a rough idea of where you would like to go before you set out. Many of the wine estates have become very tourist orientated offering guided tours, gift shops and restaurants while at some of the small estates you may end up sitting in a rustic cellar sipping wines with the wine maker himself. Different experiences appeal to different people, but whether it's big or quaint you prefer you're sure to find something that appeals to you. Stellenbosch is home to the first offical wine route that was founded in 1971 - entrances to wine farms are clearly sign posted and wine may be purchased at all of the cellars. Both national and international delivery can be arranged. Wine estates worth paying a visit to include Neethlingshof, Delheim, Spier, Saxenburg, Welmoed and Delair to name a few. 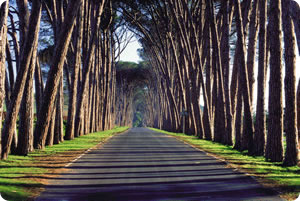 The beautiful tree-lined avenue leading to Neethlingshof Estate. For further assistance while in Stellenbosch, visit their Information Centre at 36 Market Street. Tel: (021) 883 3584. The Franschhoek valley was first settled over 300-years ago by the French Hugenots and the many guesthouses, streetside cafes and award winning restaurants demonstrate a truly French flair. Lying against the backdrop of the majestic Franschhoek and Drakenstein mountains, the town with its picturesque main street showcases antique stores and art galleries rubbing shoulders with bakeries and the chocolaterie. Franschhoek is also home to many festivals from the annual Bastille Day festival (14 July) to cheese, wine and olive festivals at various times throughout the year. As with Stellenbosch, one could easily spend a day or two in Franschhoek wandering the main street, visiting the wine estates and dining at one of its eight 'Top 100' restaurants. To truly relax and unwind, consider spending a night or two at one of the many guestlodges, B&B's or self-catering cottages. 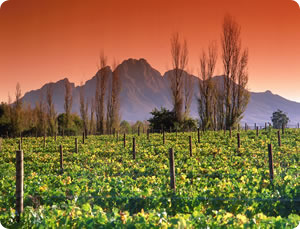 Wine estates worth visiting include La Motte, Boschendal, Chamonix and Cabriere to name a few. La Motte vineyards in Franschhoek. A number of other excellent wine farms can be found slightly further afield in the Paarl and Wellington areas. Once again, the towns are steeped in history and set against beautiful backdrops of mountains and vineyards. Pay a visit to Rhebokskloof and Simonsvlei or simply take a drive and enjoy the scenery. > Watch a video clip on the historic town of Stellenbosch. > Wine route guides and maps are available at most tourist information centres. It would be very helpful to pick-up a copy for maps, details on each of the estates and operating times. Try to orientate yourself beforehand to make the most of your time. > Most of the wine estates are open Mon - Sat, but some may be closed on weekends. > Remember that drinking and driving is a heavily fined offense in South Africa. If you plan on tasting and drinking alot, rather opt for a guided tour with a driver. > If you're interested in visiting many wine farms in the various regions, consider spending a night or two at one of the many hotels or guesthouses in the winelands. You'll find you have less driving time and the region itself is extemely beautiful with many other attractions and excellent restaurants. > For a sumptuous Mediterranean style buffet lunch visit Olivello Restaurant at Mont Destin wine farm. Children are very welcome. > For a family picnic, children will love the setting around the dam at Spier where the grassy banks are shared with the resident ducks. Ready made picnic lunches can be bought or visit the farmstall to create your own. > For a dining experience 'in the sky' Delair provides spectacular views towards the Franschhoek valley. Dine in their restaurant or enjoy a picnic hamper lunch beneath the trees.